1 IP Rating - AKA "Ingress Protection"
2 US MIL-STD-810G - AKA "US Military Standard"
Rugged phones seem to be all the rage these days, and with Samsung, Sony, and others releasing high-end devices with allegedly lifeproof qualities, it's hard to know whose rectangular slab really is the toughest. In reading about devices like the Galaxy S4 Active, Xperia ZR, and Casio G'Zone Commando LTE, you've probably seen some ruggedness "ratings" tossed around. Sometimes, these rating come with a bit of information (eg., waterproof to 1 meter up to 30 minutes), but rarely are the ratings explained in a particularly satisfying way. Well, let's see if we can shed some light on some of the more common ones. IP Rating - AKA "Ingress Protection"
IP ratings are a set of standards published by a body called the International Electrotechnical Commission (I'm sure their parties are a blast), and focus on a mechanical casing and / or electrical enclosure's ability to resist intrusion from solids (dust), water, and in the case of dangerous objects, people. In the case of smartphones and tablets, though, we're really only concerned with the dust and water aspects. Let's use the Xperia Z as an example. The Xperia Z has two IP ratings (more on that in a minute): IP55, and IP57. IP ratings are actually two ratings in one - the first digit represents solid ingress resistance, and the latter represents water. The higher the numbers in the rating, the more resistant a device is to a particular kind of ingress (be it solid or liquid). The first "5" in 55 means that according to the general IP standards, the Xperia Z is dust protected, not dustproof. Dust may enter the enclosure, but not in sufficient quantities to cause malfunction. The second "5" in 55 means that the Xperia Z is resistant to water sprayed from a 6.3mm nozzle in any direction. Resistant means that said spray will have "no harmful effect" on the device. This test must last at least three minutes, with 30kPa of water pressure being used (that's 4.35PSI). So why is the Xperia Z IP55 and IP57, then? That's a good question. In order to claim a device has one specific IP rating, it must pass every test leading up to the highest rating achieved. If you want to be IP68 (the highest rating), you have to achieve dust ingress protection levels 1 through 6, and water ingress protections levels 1 through 8. I think the Xperia Z failed water ingress protection level 6. Level 6 sprays a 12.5mm nozzle at 100kPa (14.5PSI) for three minutes straight at all parts of an enclosure, and that adds up to over 300 liters of water (79 gallons). That's a lot, and from a pretty high-pressure spray. I think the Z was able to succeed at level 7 (which is merely submersion), but at 6, it couldn't get the job done. Thus, two IP ratings, indicating a gap in the water ingress protection rating. The same happened to the Xperia ZR, which is rated IP55 and IP58. So that's IP ratings. If you want to know more, guess what: there isn't a lot to know. The bodies that IP-certify hardware only release the exact specification requirements to entities seeking a rating (which they pay for, of course), so the most detail you're generally going to get is in those Wikipedia tables. IP ratings used to also be used for shock resistance (that meaning kinetic energy, not electricity), but that part of the standard has since been dropped. US MIL-STD-810G - AKA "US Military Standard"
The other major ruggedness standard touted by smartphone makers is MIL-STD-810G, which we'll just call the 810G standard for short. The 810G standard actually isn't much of a standard at all, it's a set of certifications developed by various arms of the US military and Department of Defense. Well, it's not even really that, because no one actually governs the certification of consumer products as compliant with any of the 810G standards. Yes, this is a little confusing. Allow me to explain. Test Method 526 Rail Impact. Is the Casio G'zOne Commando 4G LTE fungus resistant? IS IT, CASIO?! (It's not claimed to be.) The other issue with the 810G standard is that because there is no central certifying body, companies can come up with their own versions of tests to meet the standards. Now, that doesn't mean they can outright cheat, but they can make the tests easier in many cases. That makes claims of 810G compliance, even when specific tests are named, less reliable in some respects. Not because companies are falsely claiming compliance, but because compliance really doesn't mean anything unless you can see the specifics of the test. The one upshot? The 810G standards are available for public consumption. You can read them here. The whole thing is only 804 pages! Now, I could spend the next two weeks reading this epic tome and describe to you exactly what each testing method entails, but that actually wouldn't be particularly helpful. Let me pull out a few examples, though. You see, the 810G standards are designed to be flexible depending on where (really, in what conditions) the tested item will be used. 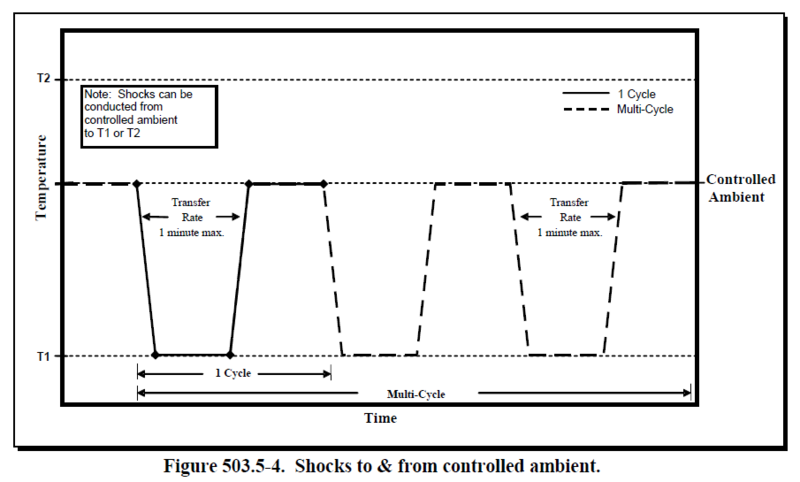 Below is a graph that lays out how to test a piece of equipment's ability to withstand what is known as "temperature shock" (moving from one temperature extreme to another, opposite extreme in rapid succession). As you can see, T1 and T2 (temperatures) are not defined, nor is the cycle time. That's because if you're testing, say, a 2-way radio designed for use underwater, it's unlikely that radio will ever experience a condition in which it rapidly goes from 130 deg. F to -20 deg. F, because water is frozen long before it reaches that temperature. So, why should it be tested to a condition it will never encounter? That's a lot of the premise of the 810G standards - equipment should be tested to the extent of the vast majority of conditions it will encounter. The standards are flexible by design. So, when Casio says the G'zOne Commando 4G LTE is "high and low temperature" 810G certified, we really have very little idea what that means specifically. 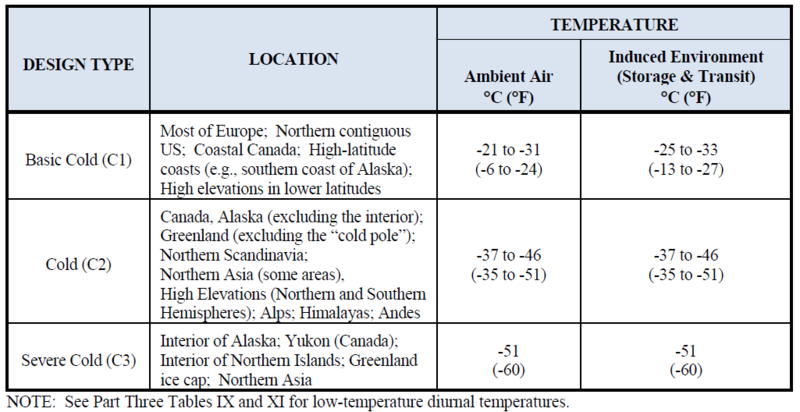 Here are three of the cold temperature ranges recognized under 810G, which Casio could have published, but chose not to. What level is the G'zOne certified to? Probably only C1. However, most non-rugged smartphones can probably meet C1, too. Your phone really has no moving parts (no spinning disks to freeze), and the weakest links in the thermal shutdown chain are the battery and display. 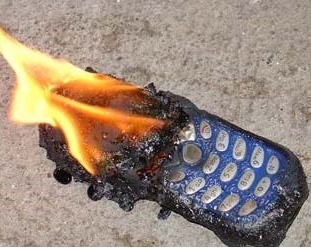 You can take a look at this article on Popular Mechanics, where you'll find that most phones will function down to -20 deg. F (and some beyond) before experiencing major problems, and that's enough to land squarely in the "C1" OK'd category. I would be surprised if Casio had actually designed a phone to work in the -35 to -51 deg. F range, because the results of the test I linked above indicate most phones will experience severe battery and LCD problems at those levels, so I'm not sure exactly how Casio would get around such issues (unless the exposure time was very short). 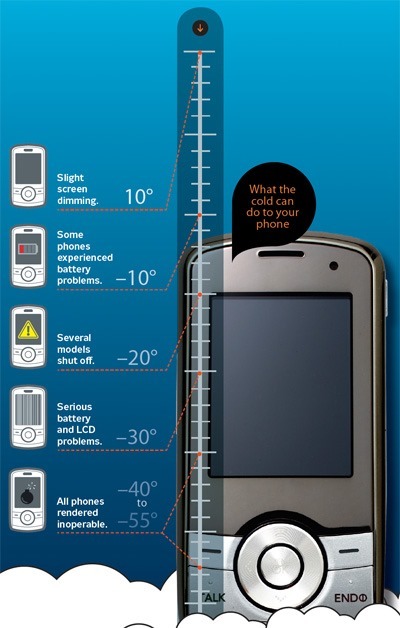 Here's a nice little graphic from the article illustrating phone function in extreme cold. My favorite 810G standard Casio claimed was that of "solar radiation." Yes, the G'zOne 4G LTE works in the sun. No, really, that's the test. You leave the phone out in the sun, simulating day / night cycles, for three days or so (depends, again, on testing procedure), and see if it works (and has not been discolored) before, during, and after the test enough that it meets the functional "requirements" of the device, aka Procedure II. a. Procedure I. 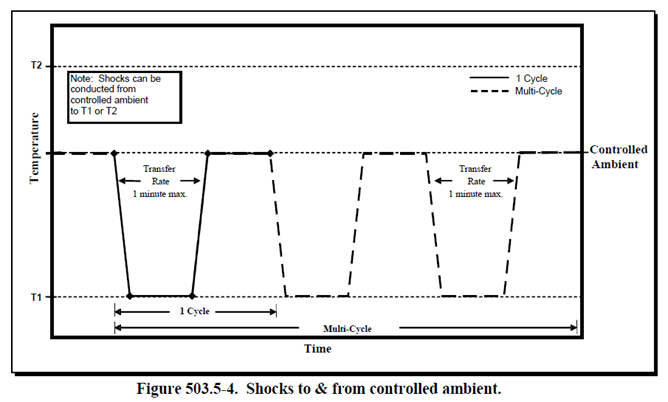 Do not alter the performance characteristics either at the peak temperature or after return to standard ambient conditions to the extent that the test item does not meet its requirements. Record as observations only those actinic effects that do not affect performance, durability, or required characteristics. b. Procedure II. Do not alter the performance and characteristics (such as color or other surface conditions) of the test item to the extent that the test item does not meet requirements. Record actinic effects that do not affect performance, durability, or required characteristics as observations only. The fading of colors could result in higher heating levels within the test item. Another fun one is the "salt fog" certification, in which the tested device is exposed to dense sea-fog mist in an enclosure for 48 hours, and then allowed to dry for 48 hours thereafter. Glass, plastic, and rubber are extremely unlikely to experience any noteworthy salt corrosion in a 48 hour span, though it's possible such a test could cause port damage to non-rugged smartphones. Basically any phone that claims to be submersible is almost guaranteed to be salt-fog proof, though. It's not a knock of the certification, but it does minimize the significance a bit. US-MIL-810G does do shock resistance (drop tests), too, which the G'zOne managed to pass at heights up to 1.5 meters. That's basically a chest-high tumble, so you can rest assured that your G'zOne will survive falls covering the distance from your hands to the ground in most circumstances. If you want even more drop-resistance, the Caterpillar B15 runs Android 4.1 and can live through a full two meters of free-fall. If you're even more obsessed with gravity-protection, Otterbox's flat-out insane Armor Series for the Galaxy S III may strike your fancy (tested to 10' drops). Hopefully you now know a bit more about smartphone ruggedness. Specifically, the IP and US-MIL-810G standards often cited by smartphone OEMs. Neither standard is perfect, and much of the time, they don't even tell you what's going to happen in the most common smartphone-damage scenario: drops (drop-test certified phones are quite rare). Which should make you realize that drop test videos are really, really pointless and - more importantly - totally unscientific / anecdotal. If you have any comments to add about ruggedness ratings, or questions (I'll do my best to answer), do so in the comments below.